The Swiss great goes in search of an eighth Wimbledon title against Marin Cilic later. Federer will take to Centre Court once again this afternoon. FIVE YEARS AFTER his last Wimbledon triumph, Roger Federer can capture a record eighth All England Club title this afternoon and become the tournament’s oldest men’s champion of the modern era. With his 36th birthday fast approaching, the evergreen Swiss will comfortably succeed Arthur Ashe, who was almost 32 when he won in 1975, as Wimbledon’s most senior champion. “I was hoping to be in good shape when the grass court season came around,” said Federer who, for good measure, also pocketed back-to-back Masters at Indian Wells and Miami as well as a ninth Halle grass court crown. Sunday’s match will be his 102nd at the tournament and his 29th final at the majors. “It makes me really happy, making history here at Wimbledon. It’s a big deal. I love this tournament,” said Federer, who has been tied with Pete Sampras on seven Wimbledon titles since beating Andy Murray in the 2012 final. “All my dreams came true here as a player. To have another chance to go for number eight now, be kind of so close now at this stage, is a great feeling. While ‘Big Four’ rivals Murray, Novak Djokovic and Rafael Nadal failed to even make the semi-finals, Federer has been reborn. However, Cilic’s game is made for grass and 12 months ago he led Federer by two sets to love and held three match points in an epic quarter-final which the Swiss superstar eventually claimed. “I don’t want to say it’s more relaxed going into it because I have a good head-to-head record against Marin, even though the matches were extremely close,” said Federer. “But it’s not like we’ve played against each other 30 times. You feel like you have to reinvent the wheel. However, he has only won one of his last 12 matches against a top five player at the Slams, even if that was over Federer in New York three years ago. Cilic has fired 130 aces at Wimbledon this year and dropped just 10 service games. “This is Roger’s home court, the place where he feels the best and knows that he can play the best game,” said Cilic. Federer’s defeated semi-final opponent Tomas Berdych sees only one winner on Sunday. “I don’t see anything that would indicate Roger is getting older. He’s just proving his greatness in our sport,” said the Czech. Email “Evergreen Federer bids to make Wimbledon history at the age of 35 ”. 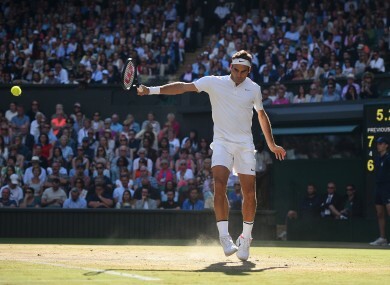 Feedback on “Evergreen Federer bids to make Wimbledon history at the age of 35 ”.